Solar panels in rural Ethiopia. (Rema, Ethiopia) Photo by Bread for the World/Flickr. Ethiopia has made an ambitious commitment to curb its greenhouse gas emissions between now and 2030. 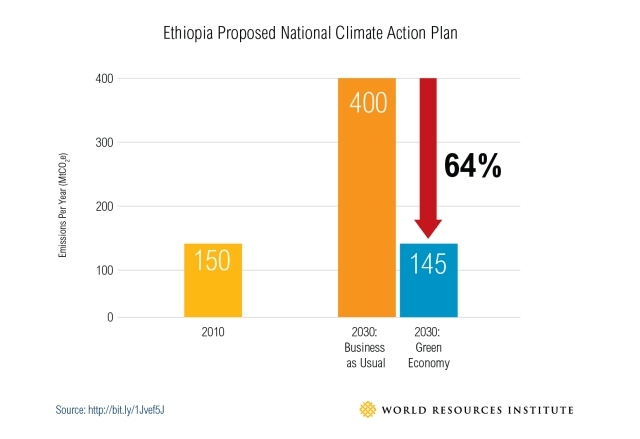 As one of Africa’s most vulnerable nations, and the first least developed country to submit its Intended Nationally Determined Contribution (INDC) to the UNFCCC, Ethiopia communicated its plans to cut emissions below 2010 levels from 150 megatonnes of carbon dioxide equivalent (Mt CO2e) in 2010 to 145 MtCO2e in 2030. This represents a major shift, since conventional economic growth would more than double Ethiopia’s greenhouse emissions by 2030. The INDC builds upon Ethiopia’s Climate Resilient Green Economy (CRGE) strategy, which commits to reducing emissions and building climate resilience while achieving middle-income status before 2025, and communicates its central goal internationally. Ethiopia’s contribution represents a 64 percent emissions reduction from business-as-usual emissions by 2030, a deeper cut than might be expected of a least developed country. Ethiopia contributes only 0.3 percent of global emissions, while 76 percent of its population lacks access to electricity and 72 percent of Ethiopians live on less than $2 a day. In the CRGE, Ethiopia identified climate actions with the greatest mitigation potential, giving priority to steps that will yield significant co-benefits and reduce climate vulnerability. The INDC indicates that full implementation of Ethiopia’s ambitious goals depends on expenditures of more than $150 billion by 2030 and will therefore require significant capital investment. However, Ethiopia has said it will tap domestic resources to pay for some of its commitment and will undertake analysis to determine what can be accomplished without support and what will require international support. In addition to being ambitious, Ethiopia’s climate commitment states its goal in simple terms—reducing emissions to a certain level in a certain year—in contrast to more complex formulations from other developing countries in the past. For example, goals framed as emissions reductions below a projected business-as-usual level are much more complicated, less transparent and make it more difficult to track progress. More countries—particularly middle-income ones—should follow Ethiopia’s example of setting clear, easily-tracked, simply-stated goals. Ethiopia’s INDC includes a section on adaptation in its climate commitment. The INDC notes the extensive adaptation planning process in Ethiopia. Ethiopia goes on to outline medium- and long-term actions to reduce vulnerability in key priority areas relating to drought, floods, and other cross-cutting interventions. These include measures such as capacity building to cope with the spread of diseases; strengthening water resource management, and developing insurance that can support farmers and herders in times of disaster. The adaptation component also notes that to achieve its long-term goal, action will be needed to identify capacity gaps and build capacity to mainstream adaptation into all public and private development initiatives. It also notes that the response to climate change requires participation of the entire population, and notes the importance of measures to increase the status of women, the welfare of children, and the well-being of the elderly, disabled, and environmental refugees. Ethiopia’s INDC is quite transparent. It includes many assumptions on goal design, including how the goal level was determined and sectoral and greenhouse gas coverage. The INDC would have been strengthened by more detailed explanation of how the land sector is to be accounted for, as well as how any units sold to other Parties would not be double counted with Ethiopia’s target. That being said, Ethiopia calls for robust accounting rules for both the land sector and market mechanisms to strengthen the environmental integrity of tracking INDCs. The INDC’s description of fairness and ambition is one of the most robust and transparent submitted so far, framed in terms of emissions responsibility, capabilities (including development needs and priorities) and potential to pursue low-carbon pathways. Other countries such as Mexico and Switzerland have used similar framing, but Ethiopia’s INDC goes further in addressing a range of issues. It provides clear data to explain its contribution, including emissions per capita (both current as well as projected), percentage of population with access to electricity, and emissions reduction potential in prioritized sectors. The INDC also highlights synergies between low-carbon development and resilience actions. While more transparency could be provided on what portion of the INDC can be achieved without international support, Ethiopia has committed to providing such details later. At this point, it is difficult to assess what emissions may result if such support is not achieved. Overall, Ethiopia’s INDC sets an excellent example for developing countries to be ambitious in their post-2020 commitment design. It remains to be seen whether Ethiopia will be able to attract enough financial support to fully implement its plans to reach its goal. But if resources are available, Ethiopia has demonstrated its commitment towards a low-carbon economy, establishing itself as a leader that the rest of the world can follow.